Benefit of sustained energy delivery. Our modern hectic lifestyle demands that we are constantly on the drive for optimum performance throughout long days. Carbohydrates provide valuable energy to the body to keep its vital cognitive and physical activities running. Most carbohydrates are readily available for breakdown and uptake; they deliver fast energy that is gone shortly after. Modern consumers are more and more looking for steady energy that keeps them going for longer. BENEO offers a unique alternative to those usually rapidly available carbohydrates and their fast energy supply. Our PalatinoseTM offers steady and sustained carbohydrate energy. Blood glucose profile of sucrose versus PalatinoseTM. The functional carbohydrate PalatinoseTM provides the body with the same amount of carbohydrate energy as sucrose does. But thanks to its unique glucose-fructose binding the energy is released slower and not all at once. Its breakdown and uptake occurs along the entire small intestine. 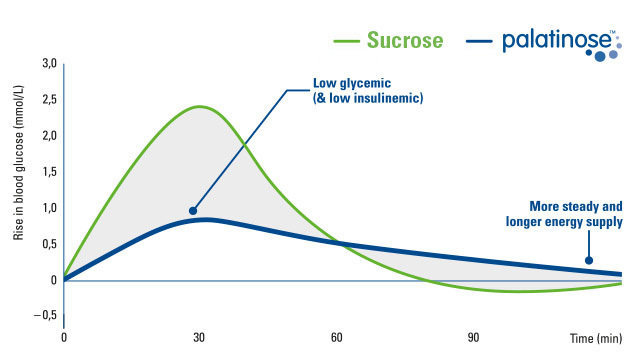 The slow and sustained digestion process is reflected by gut hormone pattern and concentrations; the corresponding slow and sustained glucose release from Palatinose™ is reflected in its blood glucose response: The blood glucose peak is lower and the blood glucose curve is stretched. As result of this, the body is supplied with fuel for longer and uses this in sustained energy gain from carbohydrate oxidation. 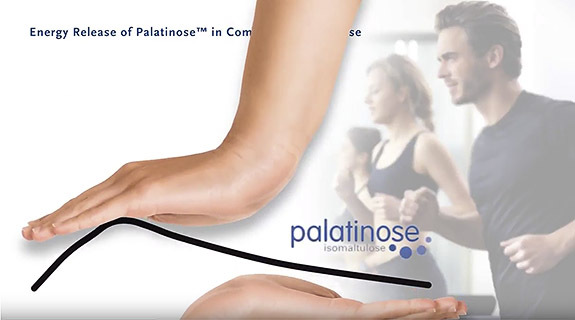 Palatinose™ and its sustained energy supply has several benefits. Unlike most sugars and starches, Palatinose™ does not block fat burning. High fat burning rates are desired in body weight management and they can also be of interest in physical endurance activity where an optimum use of limited carbohydrate sources might be advantageous. Carbohydrates and their supply of glucose to the brain play a central role in cognitive performance and mood. Studies in children and in elderly show the potential of Palatinose™ with its steady and sustained glucose supply in memory performance and mood in particular in the later morning after breakfast. These key figures of digestion, absorption and metabolism make Palatinose™ the ideal carbohydrate for active people and all others who count on physical or mental stamina. Energy release of PalationseTM in comparison to sucrose. PalatinoseTM is the only toothfriendly and fully digestible sugar. Molecular, technical and physiological qualities of Palatinose™ in support of functional sugar replacement in hypo-, hyper- and isotonic sports beverages.